Melt the butter in a large pot, and saute the onion, ginger and garlic for about 5 minutes. Add the curry powder, fresh chili and mustard seeds and cook for a few more minutes. Add the tomatoes, spring onions and lemon juice.and heat through. Add the rice to the pan and then the fish, breaking it into large flakes as you do. Add in the cilantro, reserving a bit for a garnish. Stir gently to mix everything together and heat through. Season with salt and fresh black pepper, and taste it to see if you need more lemon juice; rice dishes need lots of seasoning. Top the kedgeree with the egg quarters, garnish with more cilantro and serve the yogurt on the side. 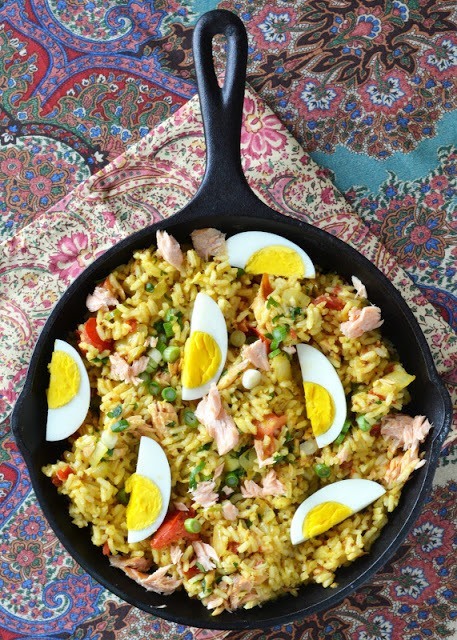 Like so many dishes, kedgeree will only get better hanging out in the fridge if you want to make it ahead.